Window glass replacement can be required in many situations including replacement of broken or scratched glass, changing the style of glass or even to upgrade to safety glass. Valiant offers a fast and reliable window glass replacement service throughout Sydney for either domestic or commercial premises. Many window glass replacements are required as soon as possible because they present a danger or security risk therefore our emergency glass service is required to resolve these situations. A specially designed fleet of custom glass carrying vehicles, which are equipped with all the necessary tools and equipment, ensures your job can be completed in the fastest possible time to minimise any inconvenience. Many homes and businesses have old glass that doesn’t comply with the current Australian standards. In the event that glass needs to be replaced all new installations must comply with the requirements of the Australian Standard AS1288. 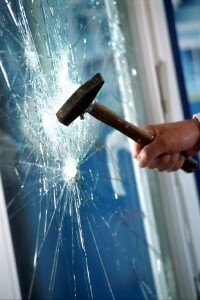 In many situations the glass must be upgraded to safety glass regardless of the original glass type. Our glaziers know the dangers of glass and compliance with this strict building code is at the forefront of their mind when carrying out any glass installation to guarantee you are receiving the correct glass every time. Safety is Valiant’s primary consideration when providing any of our glass and glazing services.